When Piper Mahoney and Lucas Richardson randomly run into each other in the lobby of a NYC hotel, three years after they shared one steamy, impossible-to-forget afternoon together, the attraction is tangible. Neither feels ready to act though. Piper has left friends and family in Boston to reboot her life after a difficult loss, while Lucas is vying for a promotion at the DA’s office and handling his own personal problems with his ailing mother. Impulsively Piper reaches out. Lucas can show her his favorite haunts in the city this summer while they enjoy a friends with benefits fling. Lucas is tempted. He hasn’t relaxed or had fun in forever and Piper was always the one woman who got under his guard. Can he keep Piper’s no-strings bargain even as he falls in love, or will their pasts strangle any hope for a future? "Wow! This story crept up on me and slowly seeped into my bones. This is so much more than a love story, though it certainly is that. This book is really about the healing power of love for both Piper and Lucas. ... I loved the meticulous way that author Kimberley Ash slowly revealed their backstories and then enabled each to heal the other. I also loved supporting character Mrs K, who plays a wonderful part offering comfort, chicken noodle soup and a grandmotherly shoulder to cry on when needed. Forgive Me is well written, well paced and an utterly engaging story. It’s definitely one that will have you reaching for the tissues but for my money this is one story that’s worth reading to the end." "Reading about these two broken characters and how they were able to give something to the other that they were unable to give themselves was heartbreaking and real. I could feel the sorrow radiating from the main characters. Very powerful stuff and I was highly impressed. It moved me to tears and that is one of the criteria I use to judge the quality of a story. I want to feel what they feel, so that I can put my whole heart into cheering for a happy ending. The healing that Lucas and Piper accomplished, alone and together, when they had the support of a unanticipated friend who had no expectations for them was inspiring and beautiful. I felt a connection for each of the characters, and between the two." "FORGIVE ME is going to break your heart, I’ll warn you of that ahead of time, but by the story’s ending, you’ll find not only yours but Piper’s and Lucas’ hearts healed once again. It’s not going to be an easy journey to get there as they each have had so many things happen in the three years since they last met, they are certainly not the same people who spent one amazing, sizzling afternoon together. Now, life has dealt blows to them, hurts and situations that are not easily mended. They cannot go back, but maybe, for a while, they can forget with each other… until emotions that always boiled beneath the surface demand to be acknowledged. When your friends with benefits relationship is no longer enough, where do you go then? I didn’t see this one coming and it hit me hard. There is so much emotion in FORGIVE ME both on the surface and deep down where it hurts to just think about the emotional turmoil these characters are going through, especially Piper. I’ll leave that for you to discover on your own. If you are a reader who likes to go deeper into the characters, to understand how they got to this place and time then you’ll enjoy FORGIVE ME. Through a slowly revealed backstory, Piper and Lucas will become as real to you as your best friends, and you’ll understand why this is such an emotional, heartbreaking and heart-mending romance. I would not hesitate to recommend this story to any Romance reader." 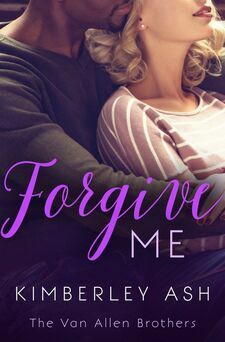 "4.5 Stars for Forgive Me which is book 1 in The Van Allen Brothers and I have to say if Piper and Lucas’s story is anything to go by Kimberley Ash will have a hit series on her hands. This is so much more than just a love story it’s a journey of two lost souls coming together as one after going through a very emotional roller coaster ride and it was a journey that captivated me. ​This story is full of love, passion, drama and some intrigue, it will take over so please make sure you have time to finish this beautifully written love story. I loved the characters and I loved how their journey was written with compassion because these two certainly have to face things that would break most of us. Great read and I’m looking forward to book 2 in the series." "I enjoyed reading this book. I loved Piper and Lucas together and how they interacted with each other. I was cheering them on. I loved how Mrs K was such a good character and so helping and she was important to this book. I felt this was well written. I also felt it was realistic and liked the way the author handled different subjects: like a broken engagement, a loss baby, guilt over a friends death, elderly parent in a nursing home whose health was deteriorating mentally as well as physically. ... I choked up at times when reading this book. I liked the plot and pace. I enjoyed the drama and intrigue. I also really liked how Piper handled Lucas’s breakdown. I loved the characters and the ins and outs of this book and I recommend it. was used to eating alone. The atmosphere in the breakroom had excluded her from the beginning. Not wanting to keep whoever it was waiting, she threw her sandwich bag across the desk and grabbed the handset. “Piper Mahoney,” she said into it, hoping she wasn’t gasping. “Of course not.” Although she had a hand at her throat, trying to ease the tightness there. hand at her neck seemed to caress her now. “The damn fool has a lot on his plate,” she said. at a man she was interested in. always said was Piper at her most Piper. Piper let him wait a moment. “Please, Pip,” he said, his warm voice hitting her straight between the breasts. He’d said no once. He couldn’t make himself do it again. ​Laurel Moore plans to turn her late father’s rundown, debt-ridden bar into the best gastropub in the county. If she had to leave her dream job as a chef in New York City to take care of her mother and brother, then she is going to do her best to bring good food and stability to the town. But the town is resistant to the change in its beloved watering hole. Her mother accuses her of betraying Frank’s legacy, and her brother is going the same way as her father. The last person Laurel is going to let into her life is Jonah Gardiner, no matter how reformed he is since they had a secret fling ten years ago. As her father taught her all too well, once an alcoholic, always an alcoholic. She’s too heartbroken at her inability to change her father’s behavior, and too concerned about the bar and her brother, to make time for someone similar now. But Jonah is the only one who can help her brother, and when he eats her food, it feels like foreplay. Spurred on by Laurel’s rejection of him ten years ago, Jonah cleaned up his act and removed all emotion from his life. Now that he’s an upstanding member of society, he might be able to think about building a relationship with someone. But not with the beautiful new owner of the bar where he spent years feeding his alcoholism. Not when her mother sees in him all the flaws her husband had. Not even when every bite Laurel feeds him reminds him of all he gave up ten years ago. And not when her brother is falling into the same hole Jonah just climbed out of. If Jonah helps Brett, he could cement his own recovery. But if he fails, he could lose more than his pride. His mother was calling the loudest, in Spanish and English, and when he’d thrown his pack to one side, it was her to whom he stood still and held out his arms. She disappeared into his arms and the rest of the squad swarmed in. From senior members who’d trained her and Matt back in the day, to newbies who didn’t even know Matt but were infected by the mood, everyone needed a hug. Well, Raya Victoria Piacenza wasn’t getting infected by nothing and nobody, even if his mother’s tearful words threatened to cause a lump in her throat. She held back from the knot of cheering fools that was now blocking the exit, causing people to swerve around it, shaking their heads and grinning at the noise, and tried to lower her heartbeat. But all she could see was Matt’s bare arm around his mother, his bicep flexed, his medic tattoo clearly visible on his brown forearm. Oh, God. To everyone in his hometown, Matthias Van Allen is a hero. Back from his posting as an army medic, he's welcomed with a party the whole town attends. Everyone's happy to see him--except his ex-girlfriend, Raya Piacenza. Matt blamed himself for the death of her father, but when he joined the army, Raya was left with no one. Raya's used to being alone now. She's made her way in the world and doesn't need anyone or anything except her jobs: an EMT captain and personal trainer. But now Matt is back, pushing her buttons in a way she thought she'd grown out of, and the worst thing is, she's now his boss. As Matt settles back into the community and Raya is offered a chance to leave it, they will have to figure out if their lives have room for each other--or if they should set each other free.